Since established Research and Development Department in 1959, our research activities have been concentrated in developing mainly mud system for petroleum- and geothermal-well drilling. In result, we take pride in the contribution to the improvement of mud technology in Japan. At present, our research activities are performed at the following two sites more efficiently in line with the enlargement of our business to civil engineering and environmental works in addition to petroleum- and geothermal-well drilling. R & D concerning mud system for petroleum- and geothermal-well drilling and treatment of waste derived from the drilling is performed here . 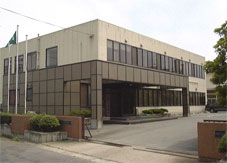 R & D concerning civil engineering and environmental works, and analytical business for soil and water are performed here.